The Shoreham Adur Tidal Walls scheme is on schedule for completion by the end of the year, with the use of a Giken press piling train ensuring good progress over the summer months. The scheme is being carried out by Mackley, as part of Team Van Oord and on behalf of the Environment Agency, Coast to Capital Local Enterprise Partnership, Adur District Council and West Sussex County Council. A major component to ensure the project is completed by the end of 2018 has been the use of a Giken press piling train to drive in the steel piles. The Giken silent piling unit, power pack, and crane are mounted onto the piles (a ‘reaction stand’), using the installed piles as tracks – like a train. The Giken piler drives piles silently by pressing them into the ground. The unit is located at the front of the ‘train’, pressing piles in at the front. The whole train walks along, following the Giken silent piler to install piles in a linear fashion. 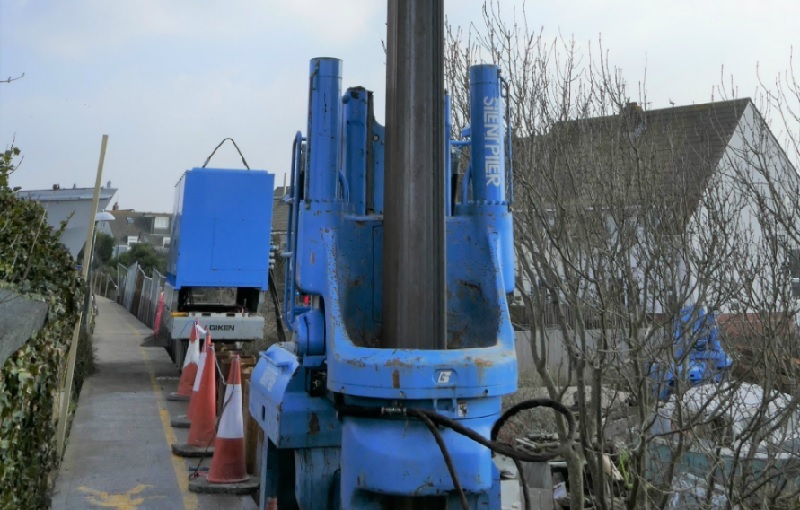 The equipment has proved to be key to working in the tight spaces between the houseboats on the estuary and the houses landside of the path, driving in the steel piles to form the wall’s core support. The process needed to be carefully planned and managed by Mackley to ensure that stakeholder agreements were completed on time; the specialist Giken press piling train needed to be booked six months in advance as there are only a very few in the world. “We would like to thank everyone in Shoreham-by-Sea for their continued patience and support. “In the W5 reach we have had to install some 1,176 sheet piles – each one 11 metres long. “The work was complicated by being close to 40 houseboats along a stretch of 700m. However, we made sure to consult with stakeholders and houseboat owners, keeping them informed on developments.